Be sure to check out the latest information and find great resources for writers, information on indie publishing, and new writers on the scene! Gold, Gods, & Titles: What's in a Name? An ancient cosmetic first developed in ancient Egypt, henna is more than just a beauty routine. Originating from the leaves of the flowering henna plant or Egyptian privet, henna has been found on mummies carbon dated to as far back as 3351 B.C. 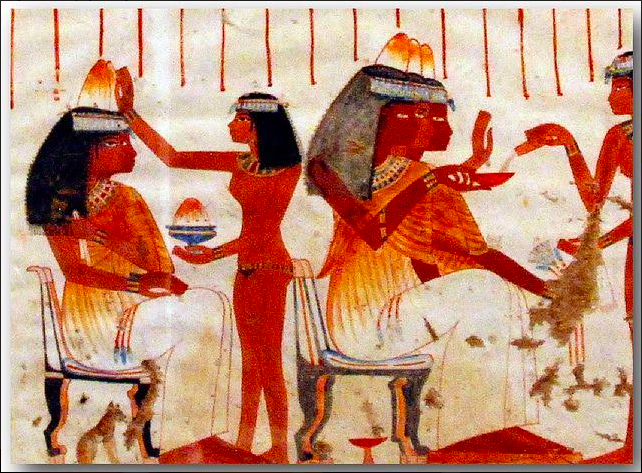 Often applied to the hair, skin, and nails, the ancient Kemetians and Egyptians used it to achieve tattoo-like designs on their skin, ginger-colored hair, and bright nails. Mummies of royalty and the nobility were discovered with the tips of their fingers still dyed a deep reddish-orange. Used by both men and women, henna designs appeared in the form of animals such as bulls, a symbol of status and virility, and on women with elaborate and creative designs. Later presented outside of Egypt as a state gift, Queen Mumtaz became the first Indian ruler to be decorated in henna, popularizing the art there in the 1600's. Designs can include floral, large scale, bold, or even geometric patterns. Today, various forms of henna can be found around the world as temporary tattoos, in Morocco on doors as a way to ward off evil, in Sudan on brides during wedding celebrations, in Hindu bridal parties and more. Who says beauty is only skin deep? An ancient cosmetic depicted lining the eyes and faces of ancient Egyptian and Kushite men, women, and even death masks on tomb reliefs for centuries. From carbon dating and testing of kohl discovered in since excavated sarcophagi, we know that the ancient cosmetic was more than just a beauty secret that gave these ancients their alluring stare. Since its discovery, archaelogists have found medicinal properties in samples of the kohl. Related scripts and ancient texts pair it with beliefs that the cosmetic worn around the eye will ward off the "evil eye." Researchers testing low levels of lead salts found in the kohl discovered that the salts contained nitric oxide, an immune boosting chemical that wards off disease-causing bacteria. This may have also protected the eyes of ancient Egyptians and Kushites from the sun and conjuctivitis related to marshy conditions along the Nile. Artifacts, documents, and paintings demonstrate that men, women, royals, and even servants donned kohl. Perhaps a lining of kohl a day kept the doctor away. 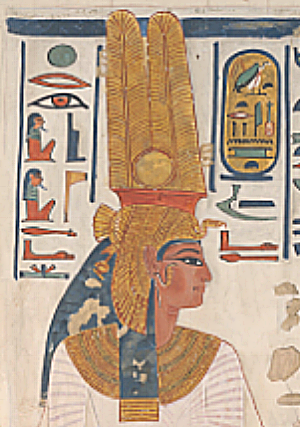 Photo credit: Brittanica: A painting of Queen Nefertari found in the queen's tomb. Duck, beef, geese, sycamore figs, dates, antelope, and honey. Ancient Egyptian tombs were uncovered that contained dozens of boxes of luxury treats and delicious bites that the deceased may want in the afterlife. 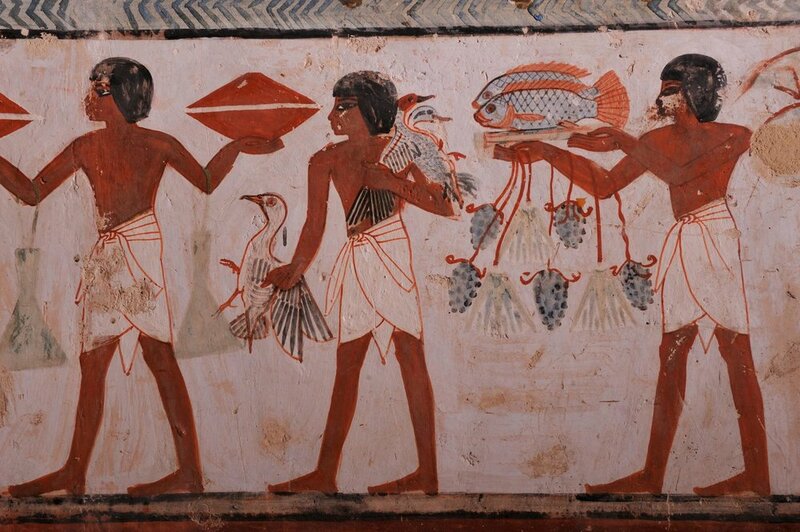 Some pharaohs spent years ensuring their food was preserved for all eternity. To keep these perishable foods ready to eat, they were mummified, just like their owners. Choice cuts of meat would be dried with salt for several days, bandaged, and covered with various resins before being packed into wooden boxes. The National Academy of Sciences revealed that beef ribs buried in King Tutankhamun’s grandparent’s tomb were covered with sap originating from a tree related to the pistachio in 1400 B.C. It is believed to have been imported from areas now inhabited by people from Syria and Lebanon, a luxury of the rich and powerful. Mediterranean and Egyptian cuisine uses a similar resin today known as ‘mastic’ or ‘mastik’ to infuse pine and smoke flavors in puddings, cheeses, sauces, and even coffee. In ancient Egypt, once you died and were mummified, one assumed aspects that resembled gods, gaining access to the Nile, and the ability to consume the same delicacies of the gods and goddesses they worshipped in life. For these reasons, preparing a tomb with all of the foods and things you might need became an important ritual. Apparently you could take it with you! Even the ancient Nubians and Egyptians loved a good drink. Until recently when antibiotics were discovered in the bones of ancient Sudanese Nubians who lived over 2,000 years ago, we never knew just how good it was. While the staples of the Egyptian diet were bread and beer with evidence that both they and the ancient Nubians consumed leafy vegetables, grain, fruits, and fish, Nubian beer was laced with tetracycline, an antibiotic found in soil bacteria that thrives in warm, arid climates. In 2014, a Japanese team uncovered the tomb of an ancient Egyptian beer maker complete with colored frescoes depicting the process of its production and use in daily life. For the Nubian beer, researchers believe it was developed purposely for its antibiotic properties and found the tetracycline in the ancient bones of Nubians as young as 4 years old. The Nubian’s tetracycline-laced beer would have contained a golden-colored mass of bacteria floating on top, making it just as appealing as the taste. It’s not a surprise this would appeal to a culture known for its love and use of gold deposits prevalent on their land. I’ll drink to that! The continent of Africa is home to a wide variety of languages and some of the oldest known written communication systems. The Nsibidi script developed by the Ekoi people of present day Nigeria and adapted by the Igb is chief among. Often recorded on ancient pottery, scholars agree that the ideographic writing was in use as early as 400 CE. Sculptures, clothing, calabashes, and the skin were decorated with this ancient writing and became used as a method of communication through gestures and writing between houses. Kept sacred and secret amongst government officials and elite members of society, these ancient symbols were used to record court proceedings and trials and demonstrate wealth and power. Slaves taken to the Caribbean islands still use a form of the writing today, known there as Anaforuana and veve symbols. With over 1,000 symbols, Nsibidi writing is elaborate and creative, serving as inspiration for artists and for Wakanda's language in the blockbuster "Black Panther." 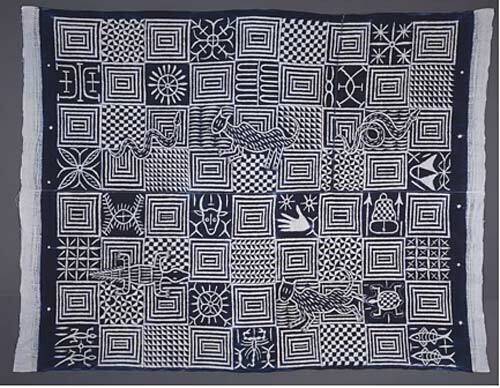 Ceremonial cloths with Nsibidi symbols like the Ukara cloth pictured here are still used among the Ekpe (Leopard) Society today. For more information see: https://africa.si.edu/exhibits/inscribing/nsibidi.html. Meroitic Pottery is widely known for being finely crafted, heavily detailed in its elaborately painted decorations, and made using advanced technology such as pottery kilns and wheels to create them. Notable for its geometric designs and floral patterns, Meroitic ceramics are most instantly recognizable for their depiction of fauna and popular animals such as the crocodile, ostrich, and frog, all found along the Nile. In addition, cobra designs and pottery depicting ankh symbols of life or particular deities were also discovered. The Empire of Kush used Meroitic pottery as bowls, oil lamps, water gourds, cups, vases, and often buried them as treasures in royal pyramids. Meroitic artists molded pottery from clay until it was dense, but fine. The walls of the ceramics were found to be so thin and hard that archaeologists came to describe them as “eggshell pottery.” Much of the classic ceramics of Meroë were products of Lower Nubia. The first ceramic depicted here is a ceramic jar dated between 240-300 A.D. which was discovered in a tomb in Ballana, an ancient cemetery in Lower Nubia. The second dates between 100 to 300 A.D. So rings the name of the Kushite and Egyptian Goddess Sekhmet. Widely known as the symbolic goddess of healing, this symbol contrasted greatly with her dual role as a warrior goddess known to protect the pharaoh or king and smite his enemies with death and plague in her lust for blood. Other names for the goddess included "Lady of Slaughter" and "She Who Mauls," though Sekhmet meant "The Powerful One." Sekhmet is depicted with the body of a woman and the head of a lioness wearing a solar disk and urareus on her head and often carrying an ankh, the symbol of life, in one hand. Several black granite statues of the goddesss Sekhmet were recently unearthed by archaeologists at Luxor. Nubia. An ancient land of rulers, warriors, miners, technology, pottery, and culture that still exists today. Nubia was known by the ancient Kemetic (now Egypt) term Ta-Seti, meaning 'Land of the Bow.' Texts dating as early as 2400 B.C. 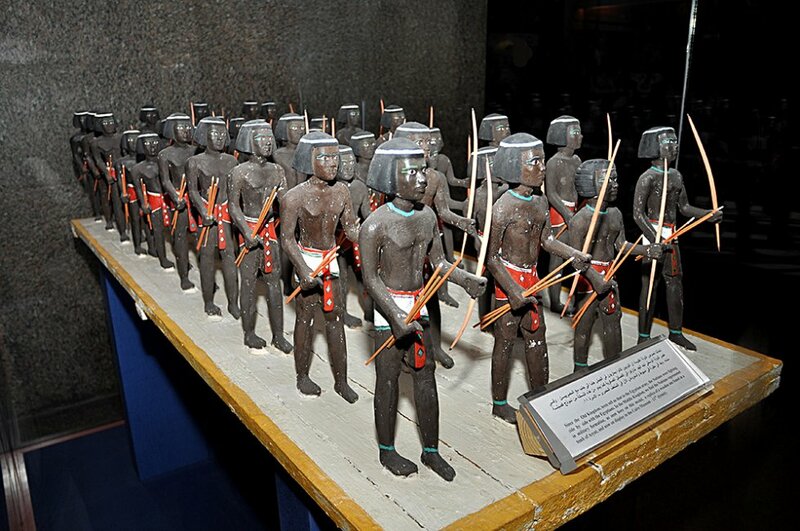 prove ancient Egyptians employed Nubian archers to strengthen their armies. Nubian archers also served as warriors in Persia's imperial army and beat back the Roman Empire's attempt to conquer the entirety of Nubia. In 641 A.D. when Arabians gained control of Egypt, Islamic historians noted in texts of the 8th Century that Nubian archers maintained such accuracy with the bow that Arabian invaders were forced to flee the Christian Nubian Kingdom of Makouria. With the ability to shoot their enemies through the eyes while on horseback, Nubians became known as "eyesmiters." He moved a step to his right, carefully stacking the paintings he’d been asked to see to in an attempt to avoid her curious fingers. The large gourds of mixed paint were under the table, and he’d see to them next, lifting them for storage so the old man wouldn’t need to suffer from the strain. She jumped at the sound of the voice, turning quickly, but not quick enough. The flash of surprise on the young apprentice’s face was the only sign that he’d seen anything. It came as quickly as it went. He was an artist training under the famed Grecian painter of Italy, brought to Cuicul to study landscapes and to learn. But he was still a slave. “And a lovely work it will be, though I doubt he could do you justice,” Liber replied. The slave had a gift for words, he would give the boy that. Though Liber preferred to use his gifts for making pictures. It mattered little to Sicarius. “Oh, stop,” she simpered, both rows of teeth showing as she grinned at him. “You ought not to tease me, you bad thing. Sometimes I have to remember you’re just a boy.” Her hand trailed slowly down his chest before she pulled it away. “I’ll return tomorrow before I leave for Constantinople. Cuicul is growing quite boring. Tell him as soon as he returns.” Without even glancing behind her for confirmation, she strutted from the room, her backside swaying in the folds of her robe as she left. She didn’t need to. Knowing she was giving a command to a slave was enough. It made her a dangerous person to cross. He said nothing. And didn’t need to. She was like all the rest of the women who lusted after the steel and blood and violence of the life of a gladiator. The ones who sat as close to the center of the coliseum as possible so they were able to see each battle. Holding their hands to their breasts in fear and anticipation. Clutching their gowns at the knees and gathering the folds inside their palms as they caught their breaths in excitement. Augustus knew what he was doing when he commanded women be given certain seating much higher and further from the gladiators they came to see. Only the Vestal Virgins were permitted to sit at the closest edges, renowned as they were for their chastity. But Sicarius had seen the open mouths and quickly rising breasts, the teeth that bit at their bottom lips, the fingers stroking at the same. The Vestals were, after all, only women. And no magic spell could prevent one from feeling something as powerful as lust. Only he was no longer a gladiator. He was rudiarii. A gladiator who had won his freedom through hundreds of gladiator fights - and the love of the mob. "WsB": Wesheb, the ancient Egyptian word meaning "to answer" perfectly defines the role of Nubian and ancient Egyptian ushabtis or shawabty's. These small funerary figurines were stored in the tombs of deceased Kushite royalty for hundreds of years during the Napatan period from about 750 to 270 B.C. The photo shows ushabtis taken from the tomb of Pharaoh Taharqa, a pharaoh of Egypt and qore (ruler) of the Kingdom of Kush during the 25th Dynasty. Made of gray serpentinite, these ushabtis were discovered on the floor in front of Pharaoh Taharqa's sarcophagus. Ushabtis generally measured around 10 centimeters tall and were often carved to appear mummified, with a hoe in each hand and a rope with a seed pouch over the shoulder. These funerary figurines were meant to magically animate in the Afterlife to carry out manual labor and other tasks on behalf of the deceased when the inscribed 'Shawabty Spell' was spoken. Taken from Chapter 6 of the ancient 'Book of the Dead,' the spell called upon the shawabty to irrigate marsh, plough fields, and ferry sand from east to west at the command of the god Osiris in Paradise. The Kingdom of Kush, an ancient kingdom in sub-Saharan Africa, was renowned for its gold deposits. Kushite Kings mined the gold, gave it as gifts to foreign lands, and molded it into precious objects and tomb treasures. This ram's head amulet is made of gold dating back to the 25th Dynasty of ancient Kemet (now known as Egypt) when Kushite Pharaohs ruled both the lands of Upper and Lower Kemet and Kush. It is dated between 712 and 664 B.C. Reliefs and other representations show Kushite pharaohs with this ram's head amulet hanging from a cord worn about their necks. The Kushite god, Amun Ra, was closely associated with the ram, a symbol of virility and fertility. "Amun" became "Amani" in the later Meroitic Period of the Kingdom of Kush during 270 B.C. to 400 A.D. This is evidenced in the naming of certain rulers such as Pharaoh Tanwetamani, King Arkamani, Queen Amanitore, Queen Amanishakheto, and King Natakamani. Writing Tip: Create Your Story Around Big Events! Create your story around big events! It’s easy to get lost in your own story. Descriptions of food, historical information, an intriguing conversation - all of these can make your story believable and better, but it won’t make up for whether or not you’ve been able to hold your reader’s attention. When you are writing and outlining your story try something new. Instead of just starting at the beginning and starting to write, follow these steps. Ask yourself what your story is about, how it begins, how it ends, and then list at least five big events that will occur during your story. Look at the following examples below. In J.K. Rowling’s case, each competition (saving a golden egg from dragons, rescuing your loved one from mermaids, fighting your way through an enchanted maze) during Harry Potter and the Goblet of Fire was a big event for the reader to get excited about and look forward to. These are all events that keep a reader interested. When reading your book you want to make sure that the only thing your reader is doing is turning the page with excitement, on the edge of their seats with bated breath as they ask themselves - what happens next?! Notoriously Shy? Afraid of Public Speaking? Don’t have a clue what to say? That’s perfectly fine if you’re going to be yourself! With that said, I want to encourage self-published authors to step outside of their comfort zones. Or surround yourself with people who will push (Read: kick, pull, drag) you outside of it. Sometimes you may find yourself in situations you never planned on, wouldn’t dream of, and are still trying to find ways out of if you can help it. However, being a self-published author means you will have to be your own company, your own marketing campaign, and your own brand. Here are just a few ideas to get you on your way. The worst thing they can do is say no! Reach out to book clubs in your area and tell them about your work! Have a young adult novel? Reach out to high school teachers and librarians! Is there a library near you? Donate a book or suggest yours for the collection! There are many ways to promote yourself, but you’ll never know what works until you give it a try. And don’t give up. The people who succeed never do. How lovely when you find a book so intoxicating that you can’t put it down! Ms. Gyasi’s words brought each character and scene to life so much so that a reader could almost feel the ocean breeze against their own skin. Her ability to juxtapose class and privilege across both regions, countries, and states is a testament to not only how well researched this book is, but, in its own way, how events affect people in different ways across generations. My sister recommended this to me as she knew I had a heavy interest in pre-colonial history and I was not only impressed with Ms. Gyasi’s ability to weave a story, but to turn each character’s own curiosity and trepidation into the reader’s! I highly recommend that you buy this book if you enjoy learning about the culture and community of Ghana, the perils of the Gold Coast slave trade, the struggle of freed slaves to find work after the Civil War, mining and worker’s rights and challenges, and the beating heart of black men and women in the United States. Ms. Gyasi demonstrates the danger of ignoring, denying, and refusing to pass down one’s history, no matter how ugly it is. Homegoing is a story of forgiveness, love, pride, and hope. I encourage you all to take the time to add it to your summer reading. It will definitely hold your attention from page to page! JUST WRITE IT! WHAT DO YOU HAVE TO LOSE? …I don’t have any spare time. …I get home too late. …I’m so tired after work. …I’m too old to start. 1. The Martian? Originally written by a computer programmer on his own website and self published and sold on Amazon for - wait for it- 99 cents! He took calls from his CUBICLE on book and movie rights while fixing computer glitches! 2. Girl With a Pearl Earring? Written by Tracy Chevalier (and later made into a movie) after her agent asked her if she had any more ideas on her next work - to which she answered she’d been thinking about the origins of a girl in a painting that hung in her house…that happened to be wearing pearl earrings. If you’re still not convinced, the only thing I have for you is my favorite line from the movie Inception: Do you want to take a leap of faith? Or become an old man, filled with regret, waiting to die alone?